Making the decision to cloth diaper can be quite exciting. You do research, you find all the cute diaper options available and you are ready and willing to get started. Then you start telling people your plans. Immediately it seems, someone has something negative to say. "Why would you use cloth? It's inconvenient/gross/expensive. Your baby will have rashes. You'll pay more in water bills. They still DO that!?" I'm sure many of us have heard one or all of these comments, right? The funny thing...most are coming from people who have absolutely no cloth diapering experience! 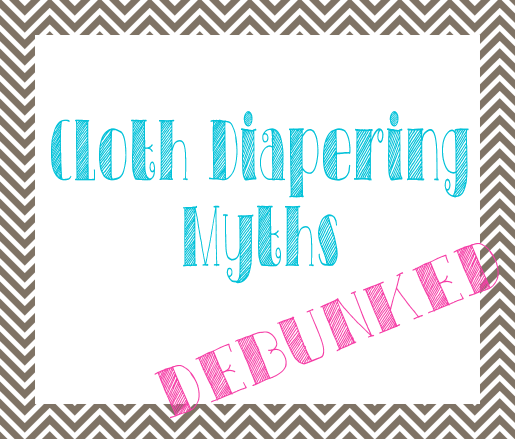 So, don't get discouraged...take a look at these common cloth diapering myths, debunked! The Myth: It's soooo much work. The Reality: Okay, sure, in some ways cloth diapering might be a little more work. If you use pockets you'll have to stuff (easy! ), you'll have an extra load or two of laundry, and maybe have to put them away once in awhile (though I'll admit I'm guilty of grabbing straight from the basket...). But you know what else is hard work? Getting little ones dressed and ready, loading them into the carseats, trying to leave the store without a basket of toys you don't need...for those inevitable trips when you run out of diapers! Both require different kinds of work, but personally I prefer the kind of work I can do in my jammies! As for the diapers themselves, there may be a small learning curve but if my seven year old son can put a diaper on his baby sister, ANYONE can do it! And if there's concern about pins and baby getting poked? Well, just show them a modern cloth diaper. No pins required. The Myth: Your baby WILL get rashes. The Reality: Cloth diapers or not, some babies are just prone to diaper rashes. Some babies DO have sensitivities to certain cloth diaper materials just as some babies have sensitivities to disposable diapers. But just because a baby uses cloth does not mean they will have rashes. My daughter has extremely sensitive skin...look at her funny and she gets a rash. BUT she's been in cloth since the beginning and has never had troubles with rashes! The Myth: They leak. All the time. The Reality: The great thing about cloth diapers is that you can usually adjust the absorbency to fit your child's needs. Some diapers may be prone to compression leaks if baby will be sitting a lot- switch to a different insert and you're set! Aside from that, if you find the diapers that provide a good fit for your little one and change as often as necessary, leaks should not be a problem! The Myth: You'll be doing laundry all the time. Your water bill will skyrocket. The Reality: Depending on your washer and wash routine, then you may see a slight increase in your water usage but in my experience personally, it's very minimal. I've compared our personal water usage to the same time period before we were using cloth and have found it stayed fairly constant. In fact, there were some months we used even less. Besides that, have you ever found a disposable diaper that can contain an exclusively breastfed blowout diaper? When my son was in disposable, we could not...and we tried them all. I was doing just as much laundry (and cleaning just as much poop) as we do using cloth! The Myth: It's too expensive. The Reality: It's no secret that cloth diapering is the cheaper option in the long run, but there's also no denying the startup cost is much heftier as well. Still, there are many ways to make cloth diapering fit any budget. From using prefolds and covers, entering blog giveaways, buying used or buying slowly before baby's arrival. Cloth diapering on a budget IS doable. The Reality: Well, to be honest I'm not quite sure how to respond to this one...why is it so gross? Oh sure, there's the poop. And the pee. But did you see my above story about the blowouts in disposable? Chances are as parents, we are going to get peed and pooped on whether or not we use cloth anyway. Is it the washing that's gross? Do you toss out every pair of undies your child has an accident on while potty training? Or every outfit that gets soiled? I'm guessing not! They are perfectly clean after each wash...nothing gross about that!! Being a parent is all about the gross! The Myth: You can't use cloth while travelling. The Reality: You may find you prefer not to use cloth while on the go out of convenience, but if you choose to use cloth full time, it's certainly doable. Pack a few extra diapers and a wet bag or two and you're ready to go. If baby will be sitting awhile (carseat or stroller) consider absorbency options other than microfiber to avoid compression leaks. We travel to visit family quite often, and while our diapers may take up more space, we've never had any problems using them on the road! But again, you can also use disposable OR hybrid options as well! The possibilities are endless! What cloth diaper myths have YOU heard?